How does content consumed in the palm of your hand versus content seen on a TV screen impact consumption? A very relevant and interesting question posed by Facebook’s Ad Research & Marketing Science Team. The webinar dealt with 2 years worth of research and over 2,000 ads run over Facebook and Instagram, to show how people engage with mobile and feed-based environments and what this means for executing creative. The answer – not so simple. 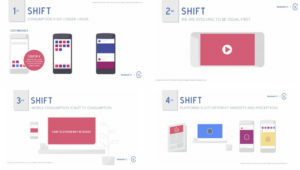 Here’s everything you missed from Facebook’s ‘Creativity in the Age of Mobile’ Webinar. Europe Results: ads that delivered the main message sooner correlated with longer views.